WHAT A GAME!!!! Two powerhouses pitted against each other for National Bragging Rights. In the end, the stronger team won. I had to laugh when Bradford was charged with that last interception; if the entire Gator team touches it, should it REALLY be an interception? ;-) That will certainly be a game highlight! Well, I'm amazed at the number of people (and MANNER of people) who hold such a strong feeling about it. 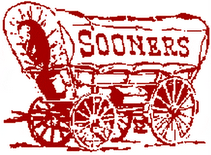 Don't get me wrong; I'm a MAJOR SOONER FAN! (and ALUMNI) I think my posts and comments will show that. But when it's all said and done, it's just a game. No one hates a sore loser OR a sore winner. Sorry for your disappointment but I saw a video yesterday that said both Tebow and Bradford were Christ-followers. Either way God would get the glory! I didn't nor do I watch f-ball although I did read about some loud mouth on OK team. Maybe should have kept his mouth shut? Serves as a notice to all that we should not be tooting our own horn. Great game! I have utmost respect for Stoops and Bradford, too. The defense played well and we had our opportunities. I was impressed with Tebow in some ways and not in others. He was intercepted twice and Bradford's interceptions were in the hands of receivers. Oh well! IT IS A GAME, like you said. To make it to that many bowl and title games is amazing to me. What a run for Stoops. I've had a friendly ribbing going on all year with a Ute like M. Steve and you, Rick. It's all part of the fun. You remember Greg Brooks, Rick? Jeff went to the National Championship game with him - the one we won - as well as another couple on either side of that one. Just curious if you remember him.